Earth receives only a very small portion of the sun’s energy, yet this energy is responsible for powering the motion of the atmosphere, the oceans, and many processes at Earth’s surface. About one-third of the sun’s incoming energy is reflected back out to space. About one-half of the energy striking Earth is absorbed by Earth’s surface. 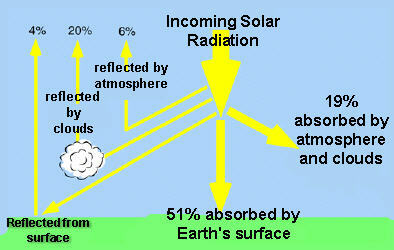 Solar radiation is made up of different types of radiation (including infrared, visible light, and ultraviolet). Incoming solar radiation is in close balance with the energy that leaves the atmosphere; otherwise Earth would heat up or cool down. Excess carbon dioxide and other gases may disrupt this balance, creating a greenhouse effect. Earth’s surface is heated unequally. When air or water is heated, the molecules move faster and farther apart, reducing their density and causing them to rise. Radiation and convection from Earth’s surface transfer thermal energy. This energy powers the global circulation of the atmosphere and the oceans on our planet. Clouds: As bodies of water (oceans, lakes, rivers, etc.) absorb thermal energy, the water evaporates causing the air to be warm and moist. Warm, moist air is less dense than cold, dry air, so it rises relative to colder, drier air. As warm, moist air rises, it gives off some thermal energy as the moisture condenses, forming clouds. Clouds are not gaseous water vapor; rather they are minute, condensed water particles. Do you know the following terms as they relate to solar energy: wavelength; ultraviolet, visible, and infrared radiation; and reflection and absorption? Can you explain the chart on Earth’s energy budget? Can you explain the greenhouse effect in terms of the energy entering and leaving the atmosphere? design an investigation to determine the effect of sunlight on the heating of a surface. analyze and explain how convection currents occur and how they distribute thermal energy in the atmosphere and oceans. analyze the role of heating and cooling in the formation of clouds. order the sequence of events that takes place in the formation of a cloud. describe the relationship between thermal energy and the formation of hurricanes and thunderstorms.